What a treat. Take your kids to the docks when they bring in the day's fresh catch! My life has always been about the sea. I have so many fond memories of fantastic Cape May summers at the Longfellow Guest House where so many fun activities related to the sea. In the early morning I'd ride my beat up old 'beach-cruiser' to check out the surf...and in the late afternoon I'd bike to the docks to speak with the captains of the party-boats and find out if the 'weekies' were biting. 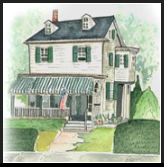 Cape May's famous Lobster House remains a great place to buy seafood - the best in town really. Get past the crowds and you'll find staff who are helpful and friendly, BUT if you're up for a little adventure, try the docks where the partyboats come in around 4pm. You'd be surprised at how many of the daytime fishermen can't be bothered to clean and eat their fish and are all too happy to part with their catch of the day. Make sure you have a small cooler with ice to tote them back to the guest house and be prepared to tip the deckhands a few dollars to gut and clean the fish! You and the kids will have a great story to tell around the kitchen table of how you landed 'the big one' for dinner. Posted on July 17, 2010 by Billy Longfellow.